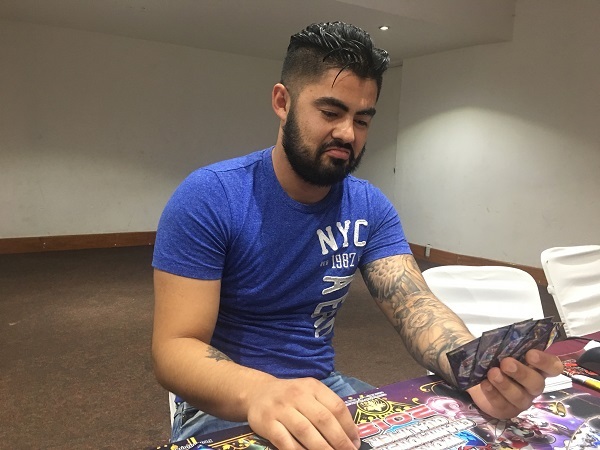 Manuel Alejandro Vargas Flores from San Luis Potosi, Mexico is Dueling against Edgar Gustavo Tinoco Serrano from Saltillo, Mexico in a Trickstar Sky Striker Mirror-Match that will determine which of these two Duelists will advance to the Finals of the 2018 Central America World Championship Qualifier! 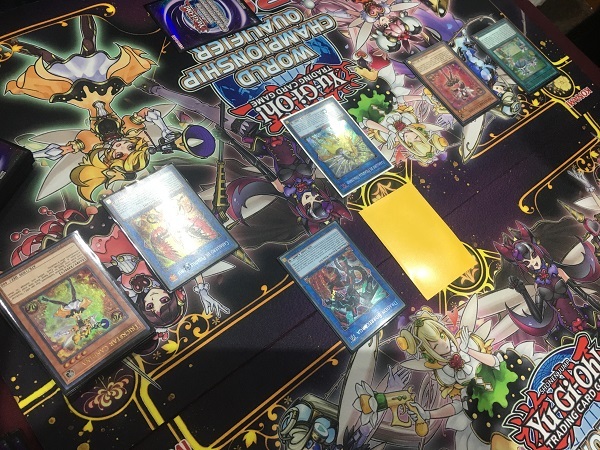 All 4 Duelists remaining in the tournament are wielding Trickstar Sky Striker Decks, so these Duelists’ skills and familiarity with the Deck will prove to be critical in their success. It’s time to Duel! Tinoco started off Duel 1 by activating Trickstar Light Stage. He used its effect to add Trickstar Candina to his hand, prompting Vargas to send Droll & Lock Bird from his hand to his Graveyard to activate its effect. He Set a card to his back row and Summoned Candina before passing. Vargas drew a card and then had Scapegoat, Sky Striker Mobilize – Engage!, Ash Blossom & Joyous Spring, Trickstar Reincarnation, and Mind Crush in his hand. He activated Engage to add Sky Striker Mecha – Hornet Drones to his hand, losing 400 Life Points to Candina and Light Stage, and then used Hornet Drones to Special Summon a Token, losing another 400 Life Points. He used the Token to Link Summon Sky Striker Ace – Kagari and used Kagari to add Engage to his hand. He then activated Engage to add Sky Striker Maneuver – Jamming Waves! to his hand and used Jamming Waves to destroy Tinoco’s face-down Terraforming. Vargas lost another 400 Life Points by doing so. He used Kagari to Link Summon Sky Striker Ace – Shizuku next and Set 3 cards to his back row. In his End Phase, he used Shizuku’s effect to add Sky Striker Maneuver – Afterburners! from his Deck to his hand. Tinoco used the effect of Light Stage to target Vargas’s face-down Scapegoat and then Set 4 cards to his back row. He flipped Terraforming, allowing him to add a Light Stage from his Deck to his hand. Vargas then flipped Mind Crush, calling Trickstar Light Stage, forcing him to discard it. Tinoco flipped Pot of Desires next, and after banishing the top 10 cards of his Deck face-down, lost out to Ash Blossom & Joyous Spring! Tinoco attacked Shizuku with Candina, destroying both monsters in battle. He activated Engage in Main Phase 2, searching his Deck for a copy of Hornet Drones to add to his hand and then drawing 1 card. He activated Hornet Drones and then used the Sky Striker Ace Token to Link Summon Sky Striker Ace – Kagari. He used Kagari’s effect to add Engage to his hand, and Vargas flipped Trickstar Reincarnation! Tinoco banished his hand of Engage and Droll & Lock Bird, but drew 2 more cards, including another Engage! He used the Engage to add another Hornet Drones to his hand and draw a card. He activated another Engage, adding another Hornet Drones from his Deck to his hand, and drawing another card from his Deck. He activated Hornet Drones to Summon a Token and then combined Kagari with his Token to Link Summon Knightmare Phoenix. He activated its effect by discarding Hornet Drones, destroying the face-down Scapegoat that was pinned down by Light Stage. He Normal Summoned Candina next, using its effect to add Trickstar Reincarnation from his Deck to his hand. He Set the Reincarnation and then ended his turn. Vargas drew Droll & Lock Bird and then activated Sky Striker Maneuver – Afterburners! to destroy a face-down Reincarnation and a Candina. He Set Droll & Lock Bird before passing his turn. Tinoco Summoned Lilybell on his next turn and then attacked directly with Lilybell, dropping Vargas down to 5400 Life Points. He used Lilybell’s effect to add Candina to his hand and then attacked Droll & Lock Bird with his Phoenix to destroy it. He banished Reincarnation from his Graveyard to Special Summon Candina and attack directly with it next, dropping Vargas down to 3400 Life Points. Vargas drew Scapegoat and Set it. Vargas drew Effect Veiler and then finally conceded. Thanks to a barrage of Sky Striker Mobilize – Engage!, Edgar Gustavo Tinoco Serrano takes a dominating victory in Duel 1! 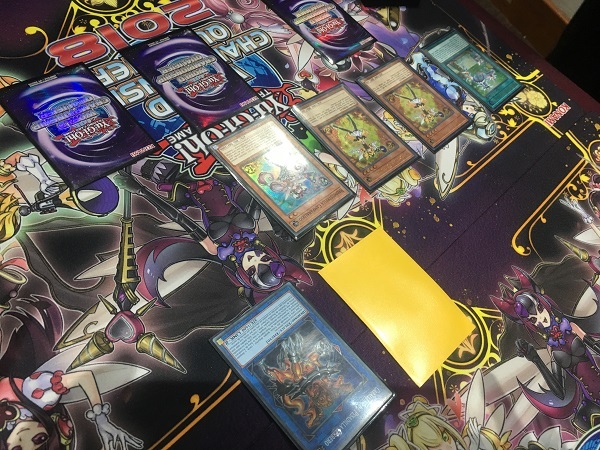 Vargas opened up Duel 2 with Scapegoat, Trickstar Reincarnation, Ash Blossom & Joyous Spring, Mind Crush, and Sky Striker Maneuver – Jamming Waves!. He Set the Scapegoat, Reincarnation, and Mind Crush and then passed his turn. Tinoco entered his Battle Phase right away, prompting Vargas to use Mind Crush, stripping him of his Evenly Matched. In Main Phase 2, Tinoco activated Hornet Drones to Summon a Token he used to Link Summon Sky Striker Ace – Kagari. He used Kagari’s effect to add Hornet Drones to his hand and then activated Hornet Drones again. He Summoned Candina next and activated its effect; but Vargas discarded Ash Blossom & Joyous Spring to negate its effect. Tinoco combined Kagari with his Token to Link Summon Knightmare Phoenix next, and then discarded Droll & Lock Bird to try to destroy Scapegoat; but Vargas Chained it to Special Summon 4 Sheep Tokens! He Set a card to his back row and then ended his turn. Vargas drew a card and then used a Sheep Token to Link Summon Link Spider. He used a Token and Link Spider to Link Summon Knightmare Phoenix next, and then discarded Jamming Waves to try to destroy Tinoco’s face-down Scapegoat, which he Chained to Special Summon 4 Sheep Tokens! Vargas used his Phoenix and a Sheep Token to Link Summon Knightmare Unicorn and then used its effect by discarding Afterburners to return Tinoco’s Phoenix to his Extra Deck. Unicorn attacked and destroyed a Sheep Token. Tinoco drew a card and then activated Light Stage, adding Trickstar Candina from his Deck to his hand. He used a Sheep Token to Link Summon Link Spider and then used another Token to Link Summon another Link Spider. He Normal Summoned Trickstar Candina next, activating its effect to add Trickstar Lycoris to his hand. He returned Candina to his hand to Special Summon Lycoris and then combined Link Spider with a Token to Link Summon Knightmare Goblin. He discarded Droll & Lock Bird to activate the effect of his Goblin and then Normal Summoned Candina next to it. He used Candina’s effect to add Trickstar Lilybell from his Deck to his hand and then Special Summoned Lilybell to his field. He combined Link Spider with Knightmare Goblin and Trickstar Lycoris to Link Summon Borreload Dragon! He then used a Token and Candina to Link Summon Knightmare Phoenix. He attacked the Unicorn with Borreload, taking control of it, and then attacked with Knightmare Phoenix. Lilybell and Unicorn attacked directly, allowing Tinoco to add Lycoris to his hand with Lilybell’s effect. He Special Summoned Lycoris by returning Lilybell to his hand and then attacked directly with Lycoris. Vargas drew Droll & Lock Bird and conceded, completely outmatched by Tinoco’s field. Edgar Gustavo Tinoco Serrano is moving on to the Finals! 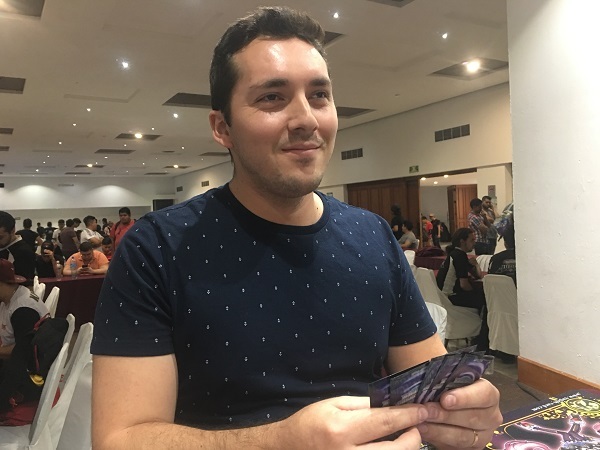 Central America Dragon Duel WCQ Winner! The 2018 Central America WCQ Finals Are About To Begin!